This unique pack will add to your inventory a lot of different elements. 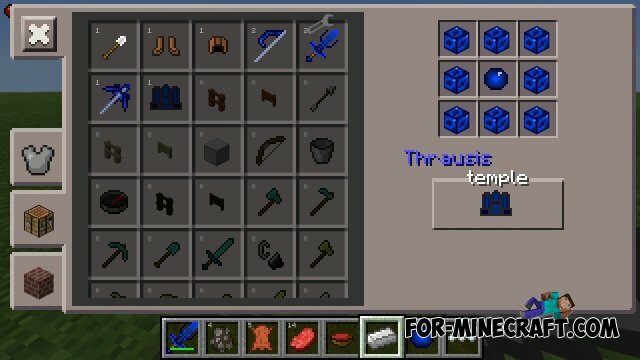 For example: three kinds of new weapons, new blocks, new bone, as well as a unique block with which spawn temple. In order to manufacture new items, you'll need a recipe Thrausis block only use it to do all the new elements. Swords are very strong and powerful, blocks will be destroyed instantly, because their damage is from 10 to 20 units. By the way, if you hit a mob, then kill him with one blow. The temple will be a stone, surrounded by torches, which will stand the diamond. 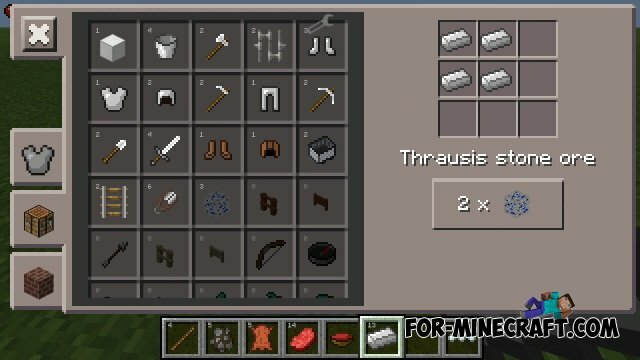 And to be crafted thrausis, take 4 iron tiles that will give you a straight 2 blocks.